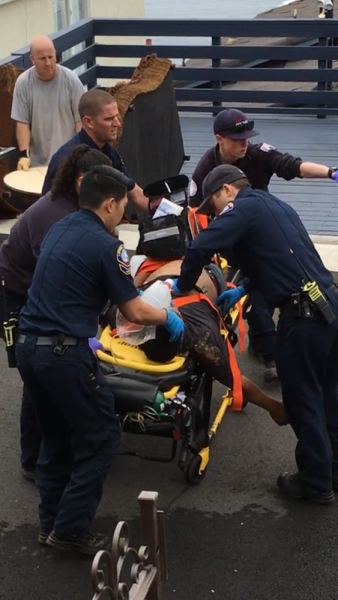 Paramedics continue to massage the heart of a worker as they prepare to transport him from a job site on Sunset Avenue. Photo courtesy of Victoria Hawlish. It was the secondon-the-job death of a construction worker in town in less than a year. In the first instance last June, investigators found no evidence that job site negligence contributed to the accident, though two contractors contested fines for other violations imposed as a result of the inquiry. Cal OSHA was notified of the incident, said agency spokeswoman Jeanne-Mairie Duvall in Sacramento. Because the worker died of natural causes, no investigation will be taken, she said. As a result of an accident at the same job site last November, Cal OSHA imposed $21,000 in fines for five violations as a result of inquiry when another worker was injured falling from an excavator, according to the April 4 penalty notice. The worker on Sunset was at the front of a six-man crew using three sets of cross bars to carry a heavy 25-foot long beam up an incline to the lot’s upper level. One lumber fabricator estimated the weight at 418 pounds. Contractor David Acker told the property owner that the worker fell against the fence, saying he was seeing stars, said Carol Chua, of Pasadena, who owns the corner lot. Acker administered CPR until paramedics arrived. “He’s numb; they’ve been friends for over 30 years,” said Chua, who has hired Acker to work on other properties over the years. She could not identify the worker, but said a coroner’s autopsy confirmed he suffered a heart attack. Chua said the worker who died was married and was the father of two teens. She did not know where he lived or if services are planned. Acker did not return phone calls seeking comment. A Cal OSHA inspector arrived at the job site Monday, said neighbor Victoria Hawlish, who shared a video with the inspector that captured a sequence of the workers as they ascended with the beam. Using manpower rather than a crane to move a large beam at a job site is not unusual as long as the task is planned out and the crew knows how to stabilize the beam if the unexpected occurs, said a local contractor, who declined to be identified. The home of 2,277-square feet that has been under construction for more than two years will likely be on hold again until the contractor is ready to return to work, Chua said. This article was updated April 13 since its print publication.